HJ: It is not your thoughts, but your subconscious beliefs, which create your reality. Thoughts arise based on our belief structures and many people make the mistake of trying to change their thoughts, which is truly an exercise in futility. To control your thoughts in this way, you would need to be vigilant every moment of every day which is exhausting at best and impossible long term. 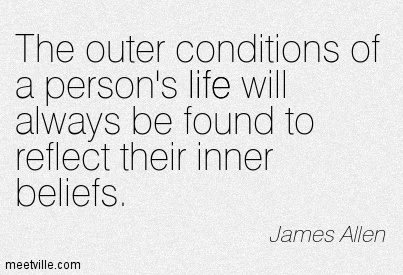 In order to change your thoughts, you must get to the root cause of their existence, which is your belief structures. When your brain decides what to think, do or say, it checks your beliefs to know how to make that decision automatically. Therefore, by changing your beliefs, you can change your thoughts and hence your reality. This is the power of installing empowering beliefs. Now, there is one level even deeper than beliefs and that is emotional charges. These are often highly unconscious, habitual reactions to situations, people, events, etc. that are embedded in our subconscious mind alongside our belief structures. You can install empowering beliefs all you want, but if you have not cleared out your subconscious emotional charges, you will continue to sabotage yourself as the emotional charges you hold, triggered by your thoughts and experiences, will cancel out any new empowering beliefs you have installed, effectively producing a neutral charge, meaning you may see only limited progress at best or none at all at the worst. Between those two activities — that is installing new beliefs and removing subconscious emotional charges — you can truly remove all blockages to achieving your highest potential and begin manifesting with the ease and effortlessness that is your birthright. None of us make decisions based on reality itself. We make decisions based on our beliefs about reality. When our beliefs are accurate, our decisions will tend to be effective, producing the results we desire. But when our beliefs are inaccurate, our decisions will often be ineffective, producing undesired results. We all know how to make decisions within the structure of our beliefs. But sometimes we run into dead ends when trying to achieve our goals or manifest our desires. Perhaps we can articulate what we want, but we just can’t seem to achieve it, whether it be a particular amount of money, a fulfilling career, a loving relationship, or a certain level of physical fitness. In such frustrating situations, the culprit is often our beliefs. Limiting beliefs hold us back from achieving what we want, turning our technically possible goals into effectively impossible fantasies. Trying to achieve a goal with a limiting belief is like climbing a mountain while carrying a 100-lb pack. You may begin enthusiastically, but soon each step will be hard and painful, and your progress will slow to a crawl. Instead of pushing yourself to climb harder, a better choice would be to lighten your pack by dumping the limiting belief that’s holding you back. Some people, however, become so attached to that 100-lb pack that they won’t let it go no matter how restricting it is. Instead they blame the mountain, the rocks, or their shoes for their troubles. But for highly conscious, growth-seeking people, eventually there comes a time to release the old baggage. The lighter pack may feel strange at first, but it will soon will enable more rapid progress, and the climb will be more enjoyable as well. You already know that you’re free to choose your actions (subject to any physical restraints you may be currently experiencing). And of course your actions have consequences. If you take action and observe a negative consequence, the wise advice would be to change your actions. If you take action and achieve a positive result, you’ll probably want to repeat that action under similar circumstances. This is just common sense, right? It’s less commonly understood that you’re also free to choose your beliefs. In fact, you’re even more free to choose your beliefs than your actions because you needn’t worry about being physically restrained from believing anything you want. Few people, however, take full advantage of the freedom to change their beliefs. Your beliefs have consequences just as your actions do, and those consequences aren’t always positive. How do you know when your beliefs are producing negative consequences? Look for areas of your life where you haven’t been achieving your desired results even after trying many different approaches. You keep trying different actions, systems, or methods, but nothing seems to work. Most likely a limiting belief is preventing you from achieving what you want, so no amount of action will prove effective until and unless that belief is corrected. Many problems which cannot be solved at the level of action can be readily solved at the level of belief. A new belief will enable you to take different actions, thereby producing different results. Changing your beliefs can be unsettling at first. But like all change, you get used to it. And once you do it enough times, you may even come to enjoy the process. If the results of the new belief are positive, I keep it. If the results are negative, I drop the belief. If the results are neutral, which is rare, I usually keep the belief just for the new experience. I enjoy seeing the world from a new perspective. One of the reasons I opted to start a personal development business is that it would be difficult for me to enjoy long-term success in any other field. At some point I’d alter my beliefs in such a way that I’d shift myself right out of any other career — the old career would cease to interest me, and I’d be attracted to something entirely different. This is why I opt to define my career in terms of its message (the conscious pursuit of personal growth) rather than any particular medium (writer, speaker, blogger, podcaster, etc), as I explained in the article The Medium vs. The Message. This business works well for me because it keeps pace with my own growth. I’m free to change my preferred manner of self-expression as my beliefs evolve. This year my primary outlet is blogging, and I earn most of my income from advertising and donations. Next year I might begin offering workshops and seminars, and after that I might release personal development books, CDs, and DVDs. My original goal was for this business to be an outlet for my own self-expression. It’s a business I’m intentionally building to keep rather than to sell. This is something to carefully consider as you work on your own beliefs. There’s always a risk that your new beliefs could make you incompatible with your current job, income, relationship, lifestyle, etc. Personally I feel the risk is worth it. Although my current beliefs are somewhat distant from social norms, they’re serving me very well. A positive shift in your beliefs can often generate dramatic physical results. For example, by adopting more empowering financial beliefs, my wife and I have greatly improved our financial situation over the past year. Compared to this time last year, both our monthly income and our cash reserves have quadrupled, while our expenses have remained relatively flat. That’s a very measurable result. Several belief shifts contributed to an improvement in my financial situation, but here’s a very simple example. Last year I had a belief that said, “Asking for donations would make my web site look amateurish and unprofessional.” Naturally I never asked for donations while I had this belief, and of course many other web entrepreneurs share this belief. But I decided to challenge this assumption, so I replaced it with the belief, “Many of my visitors want to help support me financially, and they’d be happy to donate if I gave them the opportunity to do so.” This wasn’t difficult to do because based on the feedback I was getting, the second belief seemed like it would be more accurate than the first. I knew some people would think asking for donations was downright dorky, but I was OK with that. So what happened? People started donating. Duh. Ad revenue was unaffected as far as I could tell. It appears that first-time visitors are more likely to click an ad and leave, while long-term visitors are more likely to donate, especially when they receive significant long-term value from the site. In terms of the monetary amount, total donations have been increasing every month since I added the donations page in Dec 2005. Currently donations average over $50/day. Although it’s not enough for me to live off by itself, it’s a nice supplement to ad revenue. I also like that it serves as an additional feedback channel, since people often mention a specific article in their comments when sending a donation. This is just one example of how a seemingly minor belief shift can unlock new actions and thereby generate new results. Again, the guiding principle is effectiveness. If you desire to improve your financial situation while clinging to beliefs that limit your income-generating opportunities, you’ll have a hard time getting the results you want. I happen to think that generating an extra $20K/year passive income stream is a fairly positive result. And it’s pretty good compensation for the occasional complaints I receive from fellow bloggers who cling to the belief that requesting donations is lame. I would have agreed with them at one time, but I can think of 20,000 reasons not to. Let’s see if donations buttons start sprouting all over the blogosphere now. Hehehe. Where do you find good beliefs to install? I can recommend two good places to look. First, look within yourself. Write down one of your goals, and then list any beliefs you can think of that might stand in your way. Then go over those limiting beliefs one by one, and create new beliefs to replace them. Secondly, look outside yourself. Find people who are already getting the results you want, and contrast their beliefs with your own to identify your next shifts. Reading books written by expert authors is a great way to do this, but make sure the author is already getting the results you want or is clearly on their way there. For example, if your goal is to become an accomplished real estate investor, you shouldn’t model my entire set of financial beliefs because I’m not a real estate investor. But if you wish to build a high traffic web site and generate multiple streams of income from it, then modeling my beliefs in that area should prove most helpful. Simply reading the work of other people who are already getting the results you want is helpful, since their beliefs will tend to rub off on you. But there are also some books written specifically about beliefs. For example, T. Harv Eker’s Secrets of the Millionaire Mind explores 17 beliefs that wealthy people supposedly share, and these beliefs are contrasted with those of the poor and middle class. And of course the all-time classic book on wealth-generating beliefs is Napoleon Hill’s Think and Grow Rich. I’ve found such books very helpful in adopting an entrepreneurial mindset. Neither of my parents were entrepreneurial, so I had to unlearn many of the financial beliefs I was taught growing up in order to succeed in business. Once you’ve identified a new belief, you have to install it. I explained the basics of how to do this in Podcast #5: Beliefs. Essentially you immerse yourself in the new belief until your subconscious accepts it as true and integrates it into your mental operating system. My favorite method is to use visualization, but some people swear by verbal affirmations, especially when combined with strong emotion. The techniques in the article Cultivating Burning Desire can also be used to recondition your beliefs. Be patient with yourself because it can take a while for new beliefs to take hold. It usually takes me anywhere from a few weeks to several months before I’ve successfully integrated a new belief into my subconscious, depending on my internal resistance. If there’s no resistance, I can install a new belief in a day, but that’s rare for significant changes. It takes time for my mind to accept the new belief as fact instead of merely considering it as a possibility or an interesting idea, and it has to be successfully integrated with all the other thoughts going through my head. Installing a new belief is like getting an organ transplant. It takes a while for your body to accept the new organ, and there’s always a risk of rejection. You’ll know when your new belief has taken root because you’ll begin to act in accordance with it without even thinking about it consciously. It will feel just like any other belief to you, in principle no different from a belief in gravity. Due to the integration time, it takes a while to get results with this model, but presently I haven’t come across a rapid transplant method that consistently works for me. You may find it difficult to shift your beliefs at first, but like any other skill, it takes practice. Don’t set yourself up for failure by trying to reprogram your whole life in one day. Start with something small, like getting yourself to enjoy eating a little healthier or conditioning yourself to be less socially phobic. There are no deadlines here. You have your whole life to keep experimenting. Don’t worry too much about straying from social norms. Whenever you want to push beyond average results, you’ll find yourself adopting fairly uncommon beliefs. Wealthy people don’t hold the same financial beliefs as the poor and middle class. Happy people don’t have the same emotional beliefs as depressed people. And healthy people don’t have the same diet and exercise beliefs as sickly or overweight people. The more exceptional you want your results to be, the more you have to push beyond the limitations of social conditioning. Exceptional results require exceptional beliefs. Installing a new belief is like exploring a new dungeon in a role-playing game. What new treasures will be discovered? What monsters will be stirred up? What experience will be gained? Getting that sack of loot and going up a few experience levels is easily worth a few battle scars. And what’s the alternative anyway? Spending your whole life as a level 1 human, never knowing the joys of levels 10, 20, and beyond?